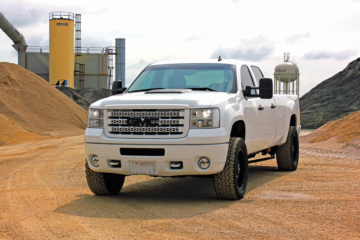 This Silverado 2500HD project was introduced in the March issue of Diesel World, so if you haven’t seen it, go snag a copy and get fully up to speed. You’ve missed just Part One of the build and the backstory behind what it’s about, so we’ll quickly recap. 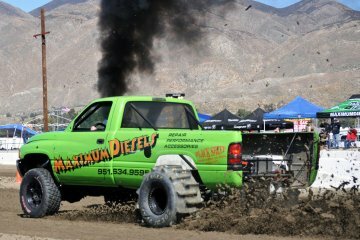 I had been driving a 2002 LB7 Duramax for almost 6 years, used it for what most owners used their trucks for: it was my daily driver, hauled kids to pre-school and dragged our family fifth wheel all over the mountains of Utah and Southeast Idaho camping. In those 6-years it turned from a basically stock pickup into a fully built 750hp twin turbo street stomper that could still do all the things I needed it to on a day-to-day basis. 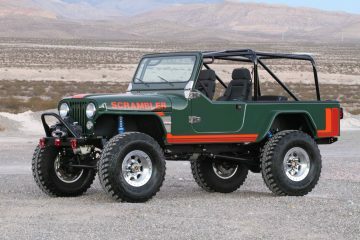 It was a lot of fun to build and even more fun to drive. Unfortunately, the love affair was ending and newer technology, quieter engines, and comfier leather seats had been calling my name. It was time to search for a truck to replace it and start over with. The Bestop EZ-Roll tonneau cover system couldn’t be any easier to install. With all the hardware included, this a simple one person 15-minute job in the driveway. The tough, premium grade leather-grain vinyl-coated polyester will withstand any climate and weather, along with being treated for excellent mildew and UV resistance. This truck came out of Canada and the previous owner had installed a nice fiberglass truck cap to keep his things dry in the cold winter weather, but as the new owner, plans of towing a large fifth wheel trailer in the summer meant that shell had to go. 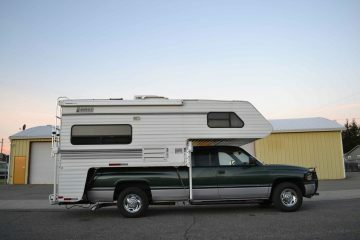 Besides, that camper shell gave off an unwanted ‘grandpa truck’ vibe that just wasn’t cutting it. 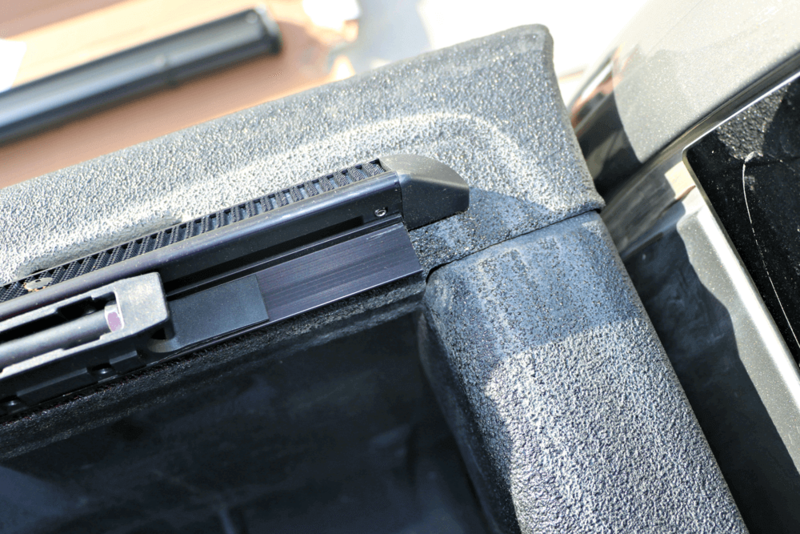 Bestop included six aluminum bed clamps to attach the new soft tonneau cover to the truck. Some soft pads are also included to offer some additional support and protection on the bedsides for a secure and simple install. Once the bed rail sides are in position, the rollup cover can be slid into the front grooves and unrolled to the length of the bed. You’ll want to take some time to make sure the entire assembly sits square on the bed and is centered front to back and side to side. Once in perfect position, the six bedside clamps can be tightened down. After selling that built LB7 and searching used car lots and classified ads, this fully loaded 2012 LML Duramax caught my eye. For the first part of the build-up I had to do something about the stock horsepower level, as jumping out of 750hp and into 350hp was not only a hit to my pride, but a bore to the driving experience. 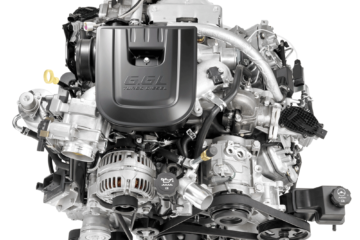 The LML engine used in 2011-2016 GM trucks makes respectable power in stock form and is more than capable of towing just about anything you want, but the aftermarket can always find a bit more on tap with a few tweaks. 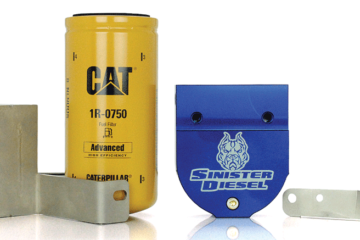 The newest Jammer Stage 2 kits from Edge Products include a cold air intake, high flow stainless steel exhaust system and their Evolution CTS2 monitor and tuning device that all work together to produce efficient, usable, CARB and emissions friendly horsepower. The kit specific to this truck was all very easy to install and literally took less than an hour to do it all. 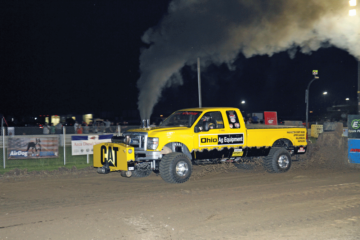 With the improvements to airflow being fed to the engine, the modifications to the ECM programming and better flowing tailpipe system this truck gained 127hp and over 200lb-ft of torque. 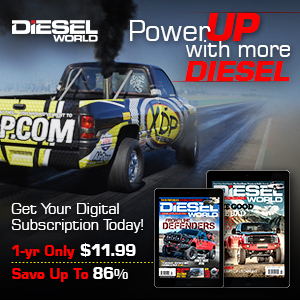 Now we won’t be daily driving the truck in that 500hp tune until we do a few more supporting mods like a fuel lift pump, but even in the Towing program the truck still produced over 440 rear-wheel horsepower and helped bump the mileage up to a solid 17-18mpg average. 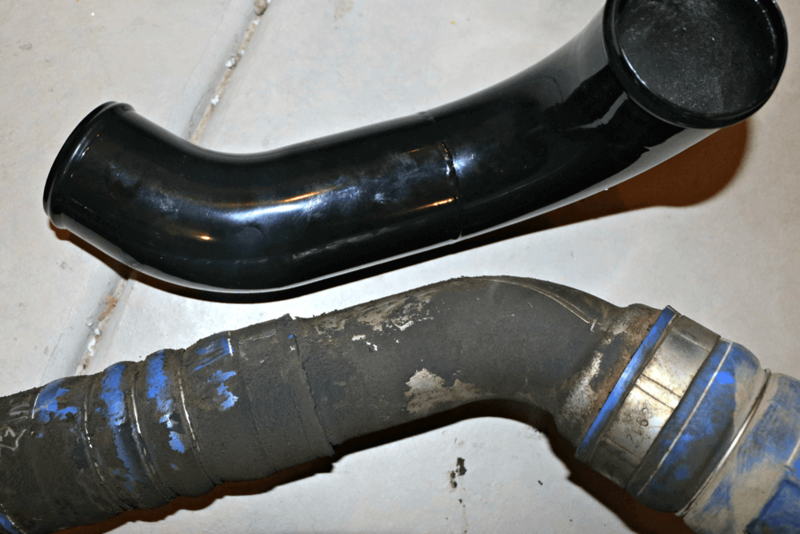 The factory driver side intercooler pipe on 2011-2016 trucks uses a somewhat restrictive 2.5” two piece tube to connect the turbo outlet to the intercooler inlet, where that 2.5” pipe expands out to meet the 3” inlet of the charge air cooler. It seems like simple logic in the way air flows through something, that a large diameter could move more volume with less restriction. 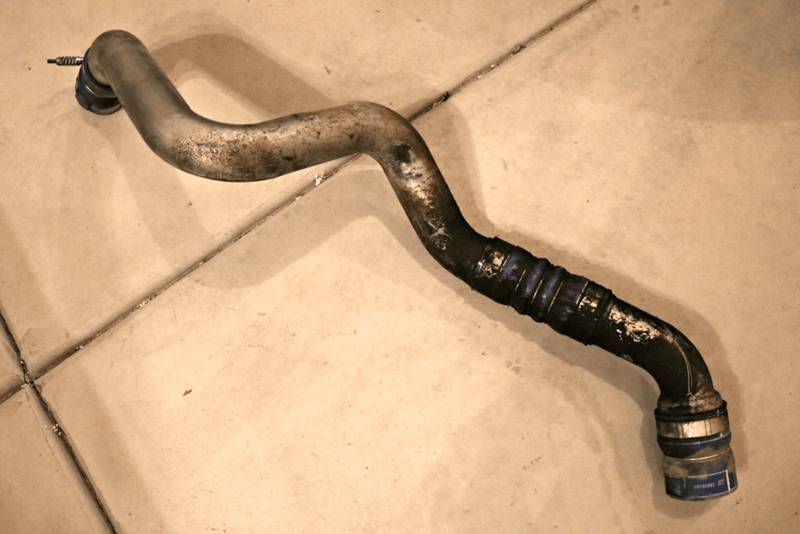 To help remedy this, Deviant Race Parts (DRP) of Hayden, ID developed a full 3” high flow hot side intercooler pipe that easily replaces the stock unit. By removing the front driver side inner fender well liner, you get pretty easy access to the charge air pipe and can disconnect it from the intercooler and turbocharger and fish it up and out of the engine bay from above. 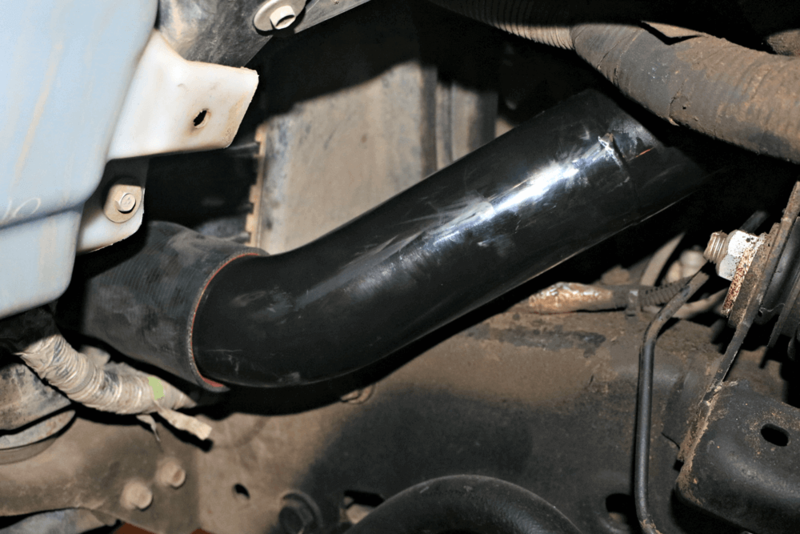 The DRP piece not only uses a larger diameter pipe to improve airflow to the intercooler, but they’ve also gone to great lengths to ensure smooth airflow passage through mandrel bent tubing and The DRP hot side pipe is constructed with rolled beads at each end and super tough silicone boots to connect it all to ensure a leak-free seal. DRP again uses the two-piece pipe design to make installation easier, but has moved the junction a little further up on the pipe to make access to the clamps and boot easier. Following along with the provided instructions, the driver side and passenger side bed rail pieces in the box need to be positioned so that extruding edge is flush with the front bed rail. This will ensure the end cap seals tightly across the front of the bed. The larger hot side pipe has shown lower EGT’s under load, quicker turbo spool-up and a slight increase in power on the chassis dyno (10hp). The fit is near perfect with no rubbing anywhere under the hood and it comes standard coated in a gloss black powder coat for a great look. 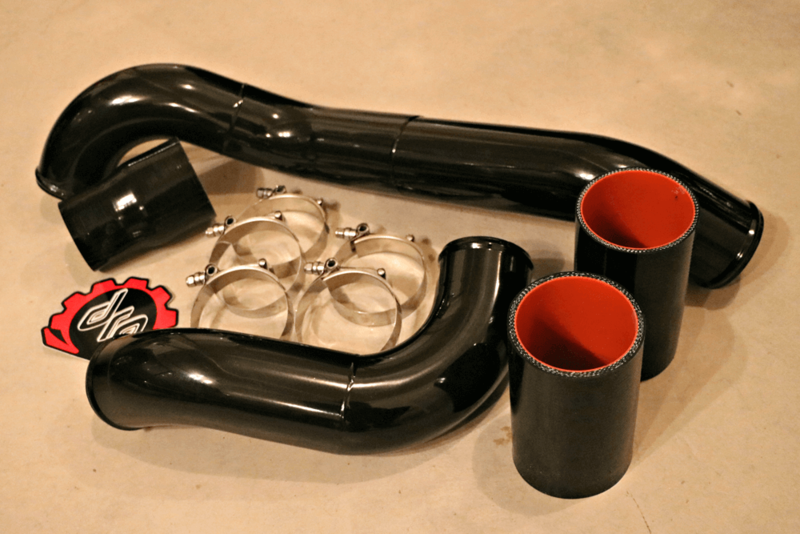 The two-piece pipe kit includes the required 3” boots and a 2.5”-3” reducer boot for the turbocharger connection. 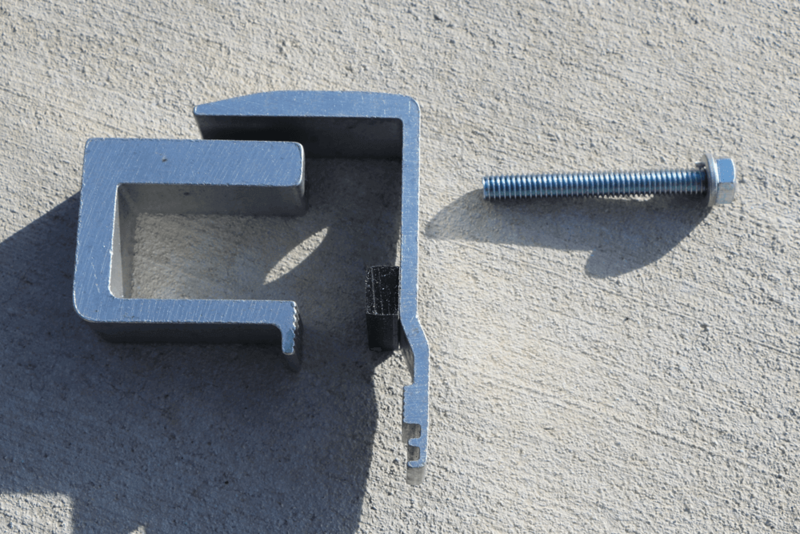 Factory style t-bolt clamps are included as well. 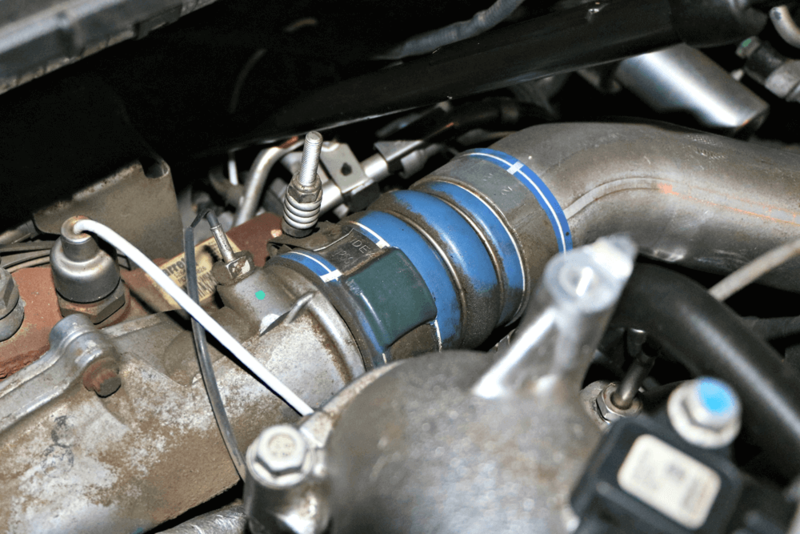 Moving forward, we’ll look at upgrading to a better flowing and more efficient intercooler and Y-bridge assembly to compliment a mild turbocharger upgrade, so this 3” hot side pipe was the perfect place to precursor those changes. Losing the shell for easier bed access or gooseneck trailer towing doesn’t mean you have to lose protection for all your things from the elements. 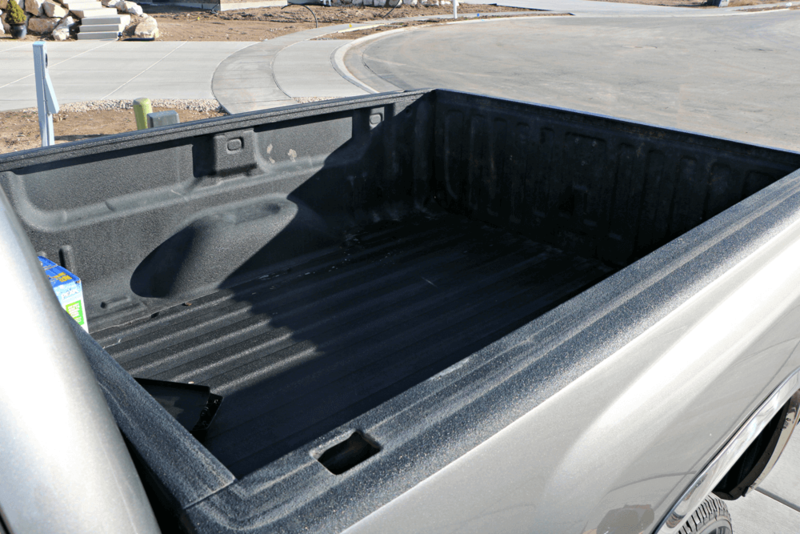 The EZ Roll tonneau cover is a simple solution to keep your stuff out of the weather, easy view of anyone interested in taking it, and give the truck a more finished look. Simply unclicking the back latches and rolling it up out of the way offers access to that bed anytime you need it. 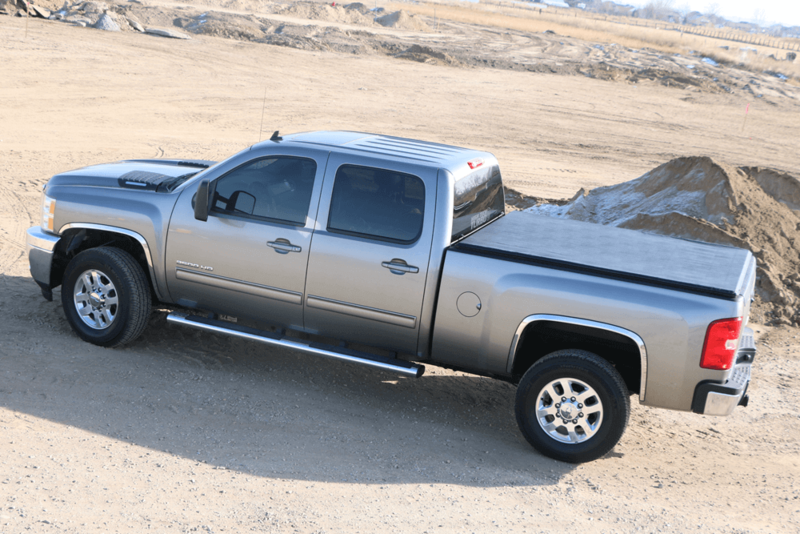 The 2011-2016 LML platform runs extremely well in stock form, but that doesn’t mean GM hasn’t left some performance on the table the aftermarket can’t take advantage of. Case in point, the hot side charge air pipe. Deviant Race Parts developed a high flow mandrel bent 3” intercooler tube that not only looks good under the hood, but will increase flow to the intercooler for better turbo response and a slight drop in EGT’s. 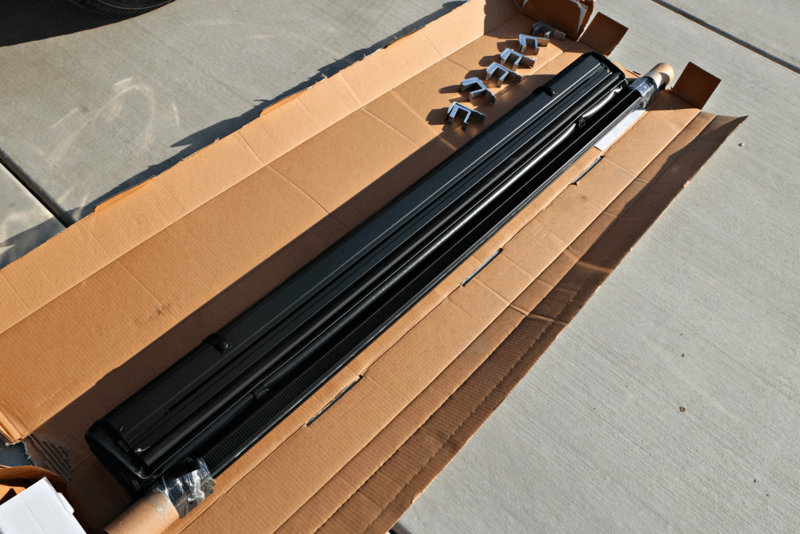 The mandrel bent piping comes direct from Deviant Race Parts powder coated in gloss black for good looks and durability. The two-piece design makes for an easy installation and each pipe end offers a nice bead rolled into it to keep the provided boots secure, even under max boost pressures. To install the new 3” boost tube, of course the stock pipe has to be removed. This is a pretty simple task and will require a 7/16” deep socket and ratchet. The upper boot that secures to the turbocharger outlet offers easy access, but the lower boot at the intercooler is a bit more of a challenge to get to. The stock intercooler tube obviously fits nicely, but it’s small 2.5” diameter can restrict flow that the LML so desperately wants under hard load, especially once it’s been tuned for more fuel like this one was in Part One of the build with the Edge Evolution CTS2 programmer. 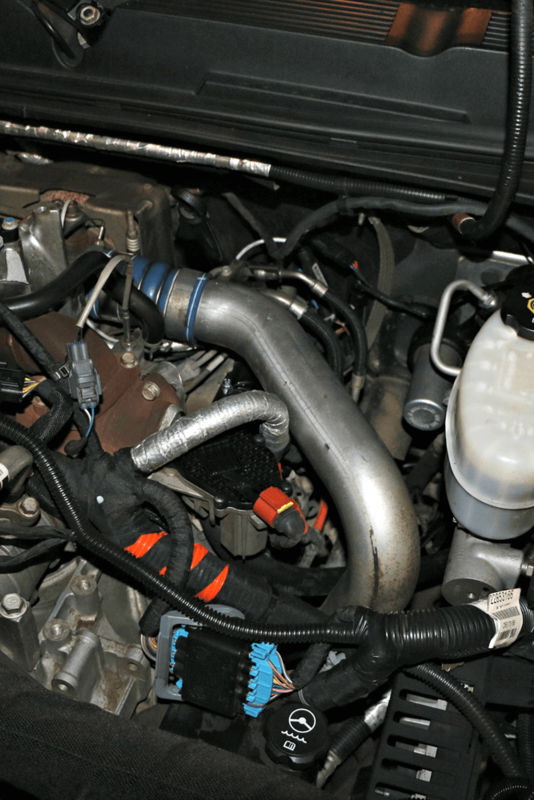 Changing the hot side intercooler pipe is extremely straight forward and will take just a few basic hand tools. The lengthiest part of this job had to be removing the factory front fender liner. GM must’ve been worried about it rattling or falling off, because about a dozen plastic clips and a handful of bolts keep it attached in various places. Even though this truck is already 5-years old and has 117k miles on the odometer, its condition really couldn’t be better. It was apparent that the previous owner took good care of the truck and kept up on regular maintenance. The Carfax report showed good records and also informed us the truck had spent its previous life in British Columbia, Canada. That helps explain some of the dirt buildup on the chassis below and that big fiberglass shell. I’m sure braving the long cold winters and dirt roads isn’t an easy task, but a truck shell would have some definite benefits trying to keep equipment and your belongings dry in the bed. Since I plan to use this truck in the summers to haul a 29-ft fifth wheel camp trailer and the shell just screamed ‘grandpa’, it took very little time get it removed. However, I too live in a cold climate that sees snow and nasty weather for a few months of the year so keeping the bed area dry and clean is necessity for me as well. My last truck had a roll-up tonneau cover installed and I swore I’d never own another truck without one. Bestop offers a few versions of roll-up bedcovers and their EZ-Roll soft cover seemed the perfect fit for the build. The sleek, low-profile cover hugs the bedsides nicely for a good look, and offers great functionality as well. The easy, no-drill installation took less than 15 minutes by myself in the driveway and the treated leather grain vinyl-coated polyester will withstand any climate and offer great UV protection. 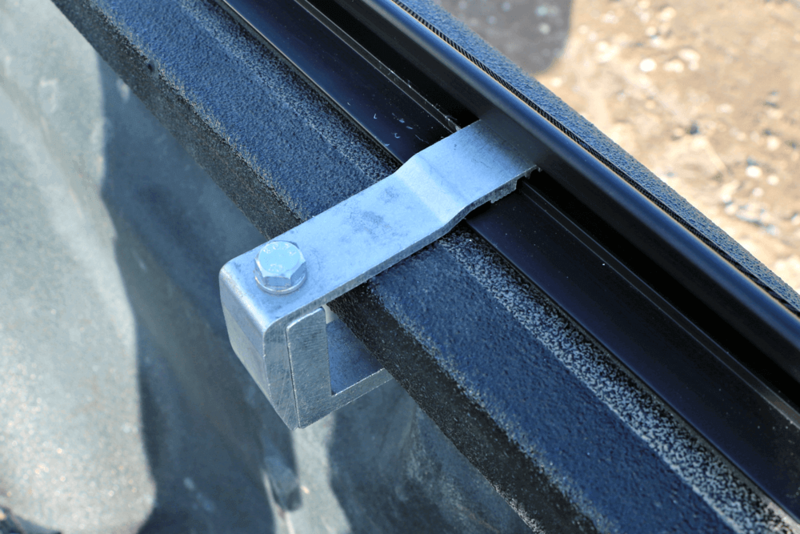 The simple hook-n-loop fastening system allows the cover to roll conveniently at the front bed rail to allow full access to the entire bed area. The EZ-Roll was the perfect answer for bed storage protection and easy gooseneck hitch accessibility when needed. 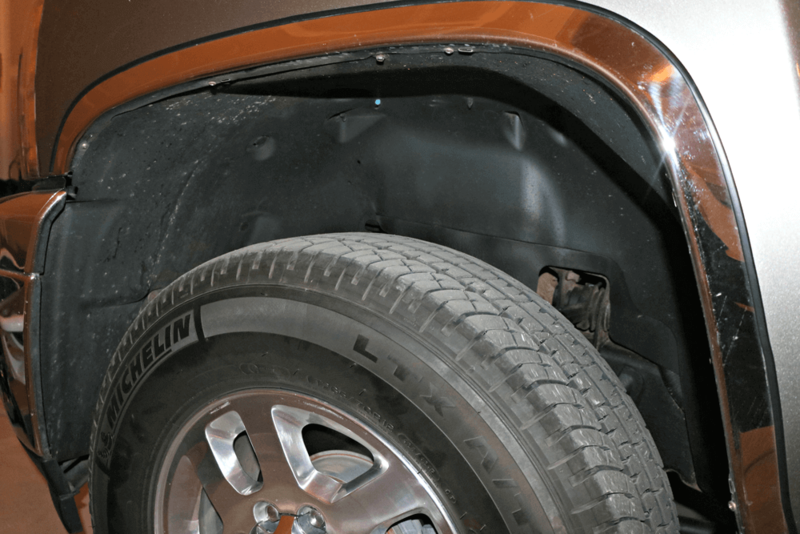 Once that fender liner is removed, you’ve got easy access to the lower portion of the charge pipe. We were able to get to the clamp holding the boot on at the intercooler with a ratcheting end wrench through here, but a couple long extensions on a ratchet could get to it as well going down from behind the grille. 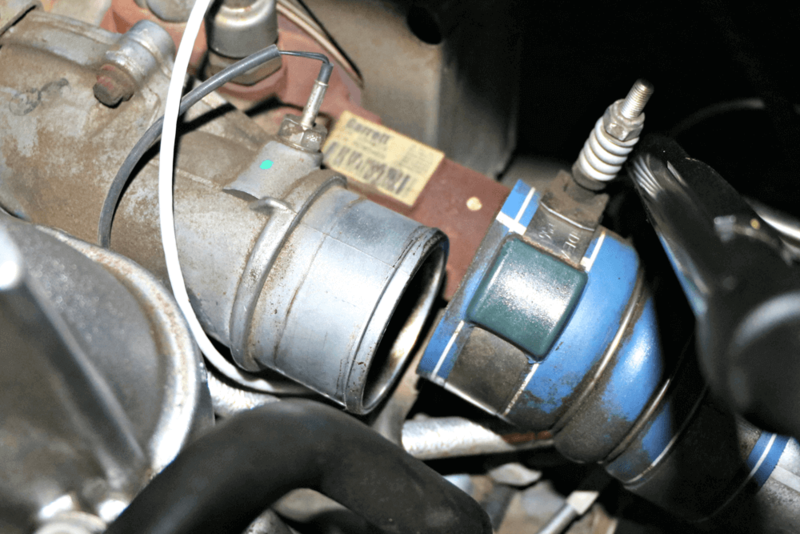 Don’t be alarmed if you see oil pooled in the charge pipe or turbocharger outlet. 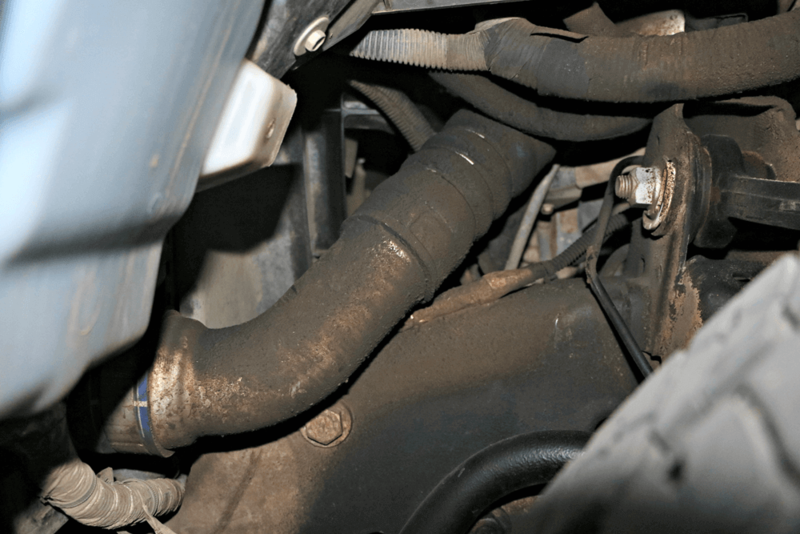 The LML uses a PCV system, which stands for Positive Crankcase Ventilation. So the crankcase of the engine breathes through a valve located on the intake to recirculate it back through the engine. This also explains the oil build-up you’ll see around the intercooler boots and pipes. The factory two-piece system can be pulled out through the top of the engine bay. It will take some fi nesse and patience as it is a tight fi t getting past the steering post, brake booster, and wiring harnesses. Notice the crimp clamps GM uses on the center silicone boot; These have been known to fail and cause boost leaks. This will all be replaced with better boots and clamps provided by DRP. Sitting side-by-side on the shop fl oor, you can compare the overall diameter difference between the two pipes. This increase in fl ow has shown almost 10hp on the chassis dyno during DRP’s initial testing, along with better turbo response and lower EGT’s. No, it’s not monumental gains, but gains none the less. Comparing the stock boot (right) to the new DRP boot (left) you can easily see the size difference. The high quality layered boots supplied by DRP will withstand big boost numbers and heat without ever showing signs of fatigue or splitting. The factory style T-bolt clamps supplied with the kit also ensure the boots stay tight and leak free. So part two of this build wasn’t quite as exciting as part one, as we didn’t get to bolt on another 127hp like we did last month with the Edge Jammer Stage 2 kit, but this project build isn’t just about making horsepower. 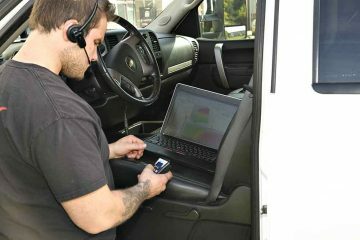 The whole goal with this build is to show how to make a stock used truck more user friendly, and how to outfit your truck to be best suited for your particular needs. 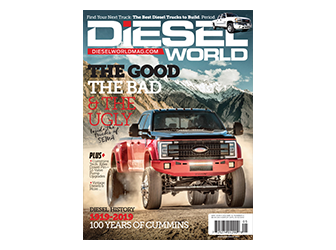 Of course, being a diesel junky, more horsepower under the hood will come with time, but we need to start adapting this truck to fit a particular lifestyle and show you readers what’s available to help you accomplish that. The shell that came on the truck had a purpose, sure, but towing a fifth wheel trailer was out of the question, so if you have the need to protect things in the bed of your truck, but still need full access for towing or hauling stuff in the bed, the Bestop EZ-Roll tonneau cover is easy on the checkbook and a super simple installation. 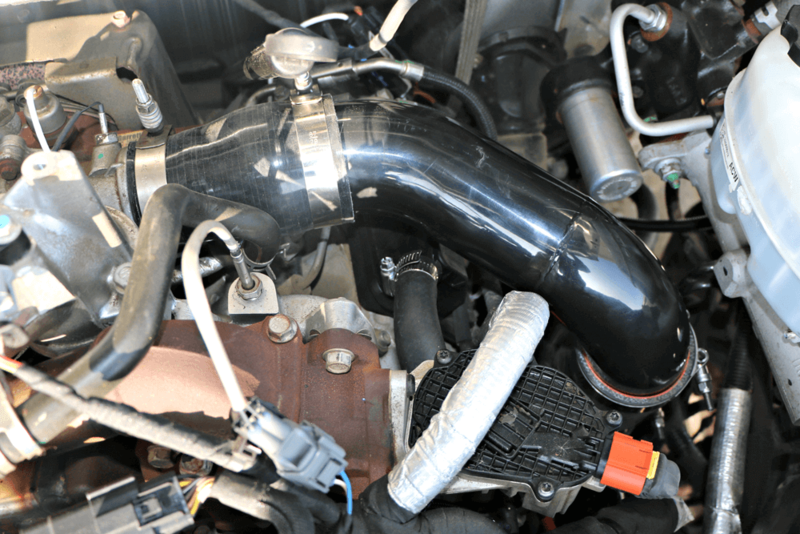 With plans of performance fuel system parts and replacing the stock turbocharger with something bigger, improving the stock charge air system will never be wasted money. 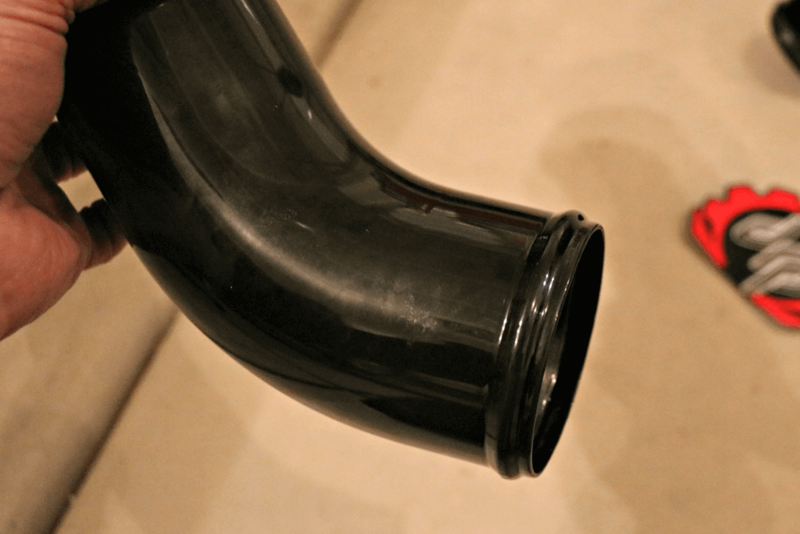 The Deviant Race Parts 3” high flow hot side pipe, again, is inexpensive and easy to install and provides better turbo response, lower EGT’s and a perfect fit, so it meets the form and function criteria required for this build. 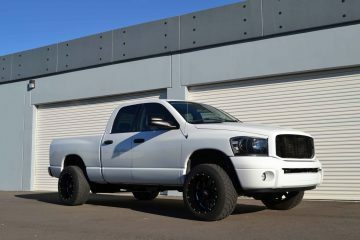 A no-brainer, bolt-on part to help turn this ordinary used truck into the ultimate family oriented daily driver tow rig. You will need to re-use the factory clamp at the turbo outlet. 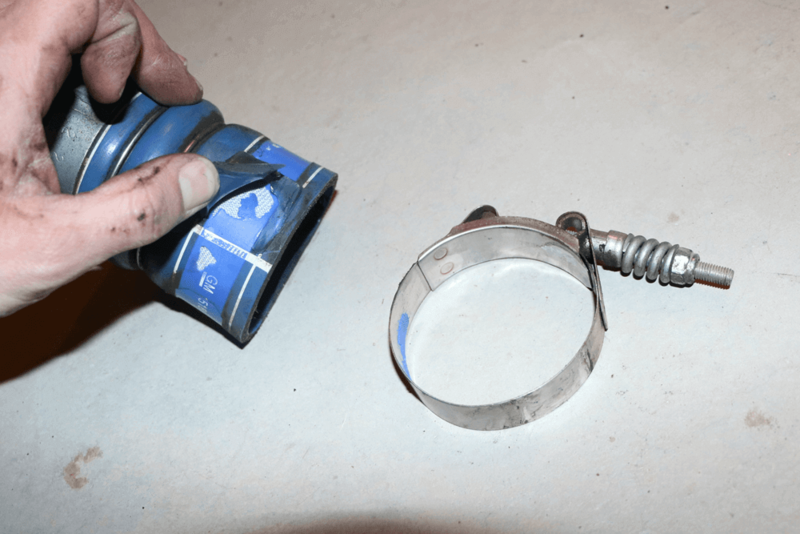 This clamp is attached to the boost tube, which will have to be cut with a razor blade in order to remove it. To install the new DRP hot side pipe, first slip one of the 3” boots onto the intercooler inlet and then slip the longer of the two pipes into position. The easiest way to do this is to slide it up into the engine bay from below, then come back into the previously installed boot at the intercooler. 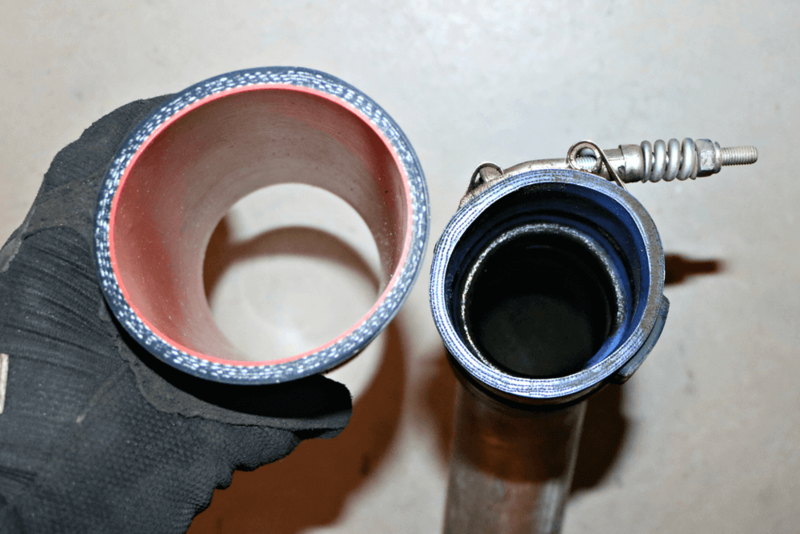 Once the lower section is installed, the other 3” silicone boot slips onto the lower piece’s inlet and the top piece of the pipe set can be installed. This piece will connect the lower section to the turbocharger and uses the included 2.5-3” reducer boot.